Global climate change is driving rapid distribution shifts in marine ecosystems; these are well established for lower trophic levels, but are harder to quantify for migratory top predators. By analysing a 25-year sightings-based dataset, we found evidence for rapid northwards range expansion of the critically endangered Balearic shearwater Puffinus mauretanicus in northeast Atlantic waters. A 0.6°C sea surface temperature increase in the mid-1990s is interpreted as an underlying controlling factor, while simultaneous northward shifts of plankton and prey fish species suggests a strong bottom-up control. Our results have important conservation implications and provide new evidence for climate-driven regime shift in Atlantic ecosystems. 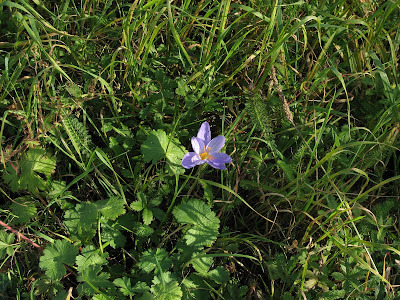 Walking near Uckfield last week I was surprised to find an autumn crocus flourishing in an otherwise very English grass verge by a main road (but some way from the nearest house). 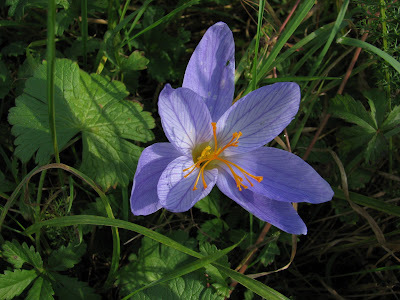 The East Sussex flora recorder, Paul Harmes, confirmed it as Crocus speciosus. This species originates from south west Asia but is naturalised in some places in England. At least it is a bit of an improvement on Japanese knotweed so I hope it survives and expands into a modest colony.